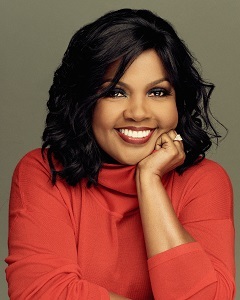 LOS ANGELES, Oct. 16, 2018 /Christian Newswire/ -- The multiple award- winning singer CeCe Winans has emerged from the studio with a glorious arrangement of tracks just in time for the holiday season. Once again, Winans team up with son Alvin Love III to present, Something's Happening! A Christmas Album (Puresprings/Thirty Tigers). The mother-son team walked away with two Grammy awards for their collaboration on, Let Them Fall in Love earlier this year. The duo snagged Best Gospel Album and Best Gospel Performance/Song in top categories. Love penned five new songs for this spirit-filled Christmas album, incorporating five classic tunes with a distinctive musical twist. The melodious sound of "This World Will Never Be the Same" written by Alvin Love III, reminds listeners how much the world has changed, but gives us hope for a better tomorrow. The whimsical, "Giving Season" paints a vivid picture of Christmastime and the spirit of giving. While the classic, "Hark! The Herald Angels Sing" delivers familiarity in the beginning, but midway through the song the tempo changes to flavorful and rhythmic percussions. In a festive contemporary seasonal carol, "It's Christmas," Alvin Love's crafted tune will have you swaying and singing along. When asked what she would like the message of this project to be, CeCe says, "My desire is that when the world hears this project that they are reminded of the true reason and spirit of Christmas. When Jesus was born something AMAZING happened that changed the world forever. In the midst of all the celebration, we must not forget to remember and offer to others the best gift of all...JESUS." The singer's music career spans over thirty years that includes a plethora of awards and honorable recognition on diverse platforms. Winans is a trailblazer that continues to be a positive influence among her peers and a breath of fresh air for her loyal fans. The vocals are masterful on this album and she doesn't fail to seal her signature sound into each song. From start to finish this 11 track album is on a path to becoming a holiday classic that will be played year after year. Something's Happening! A Christmas Album will make the perfect Christmas gift and stocking stuffer. Pre-orders for album are available at ffm.to/somethingshappening.